(C) 2013 Li Wei-Hai. This is an open access article distributed under the terms of the Creative Commons Attribution License 3.0 (CC-BY), which permits unrestricted use, distribution, and reproduction in any medium, provided the original author and source are credited. Two species of the genus Neoperla from China are described as new: Neoperla furcostyla sp. n., and Neoperla similidella sp. n. The new species are compared to similar taxa. The stonefly genus Neoperla belongs to the family Perlidae and it is the most speciose genus within the subfamily Perlinae (DeWalt et al. 2012). Itis distinguished from other genera of the subfamily by two close located ocelli, and by the abdominal tergum 7 with lobe-like processes and aedeagal tube variously armed with spines or spiny lobes (Sivec et al. 1988). There are up to 68 known species in China described by Chu (1929), Du (1999, 2000a, b), Du and Sivec (2004, 2005), Du and Wang (2005, 2007), Du et al. (1999), Du et al. (2001), Sivec and Zwick (1987), Wu (1935, 1938, 1948, 1962, 1973), Wu and Claassen (1934), Yang and Yang (1990, 1991), Yang and Yang (1992, 1993, 1995a, b, 1996, 1998), Li et al. (2011), Li et al. (2011), Li and Wang (2011), Li et al. (2012) and Li et al. (2012). In the present paper, we describe two additional species as new to science: Neoperla furcostyla sp. n., and Neoperla similidella sp. n. from Guangxi autonomous region and Fujian Province, respectively. All types, including paratypes, are deposited in the Entomological Museum of China Agricultural University (CAU). Aedeagi were everted using the cold maceration technique of Zwick (1983). Neoperla furcostyla Li & Qin sp. n.
Holotype: male, China: Guangxi autonomous region, Nanning City, Wuming County, Mt. Damingshan, 23.4047N, 108.4772E, 9 Aug. 2011, Zhang Ting–Ting. 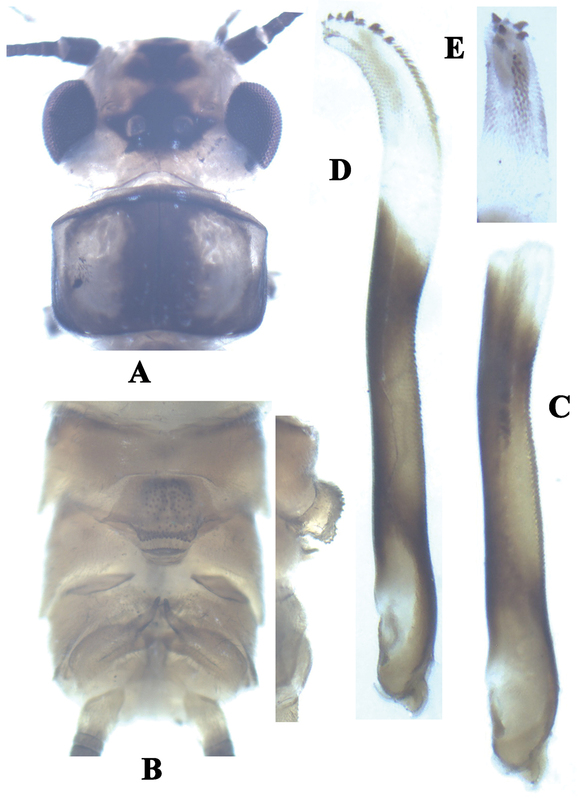 Paratypes: 5 males, same data as holotype. Male. Forewing length 16.6–16.9 mm. General body color brownish. Distance between ocelli about as wide as diameter of ocellus. Head slightly wider than pronotum, lateral margins and M-line pale, a large medial portion brown with area between ocelli and a triangular patch on frons darker (Fig. 1A); compound eyes dark; antennae brown. Pronotum pale brown with medial portion brown (Fig. 1A); wing membrane subhyaline, veins brown; legs evenly brown. Abdomen brown, hemiterga darker. Neoperla furcostyla Li and Qin, sp. n. (male). A Head and pronotum, dorsal view B Terminalia, dorsal view C Aedeagus, lateral view. 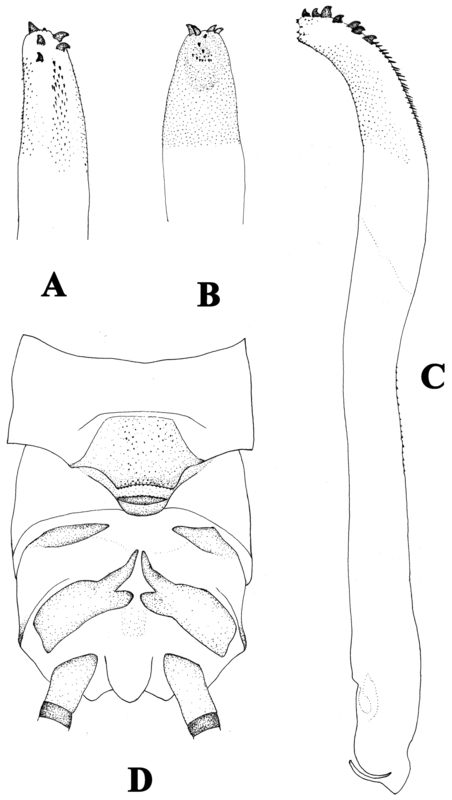 A–C Neoperla furcostyla Li and Qin, sp. n. (male). A Terminalia, dorsal view B Aedeagus, lateral view C Aedeagus of Neoperla forcipata Yang and Yang, lateral view. Tergum 7 process forming a sclerotized, upraised plateau, covered with many small sensilla basiconica (Figs 1B, 2A). Tergum 8 with a recurved quadrate process bearing small spines at distal margin. Tergum 9 without sensilla patches. Hemitergal processes of tergum 10 short and slightly curved (Figs 1B, 2A). Aedeagal tube very long and almost straight, but bearing a pale bifurcate structure with common stem located subapically (Figs 1C, 2B); dorsal surface heavily sclerotized and membraneous areas on ventral surface gradually enlarged toward tip of the tube. Aedeagal sac very short, about one fifth as long as tube, triangular in shape; with granules around sac apex and several dorsoapical spines and patch of smaller ventroapical spines (Fig. 2B). The specific epithet refers to the subapical forkof the aedeagal tube. 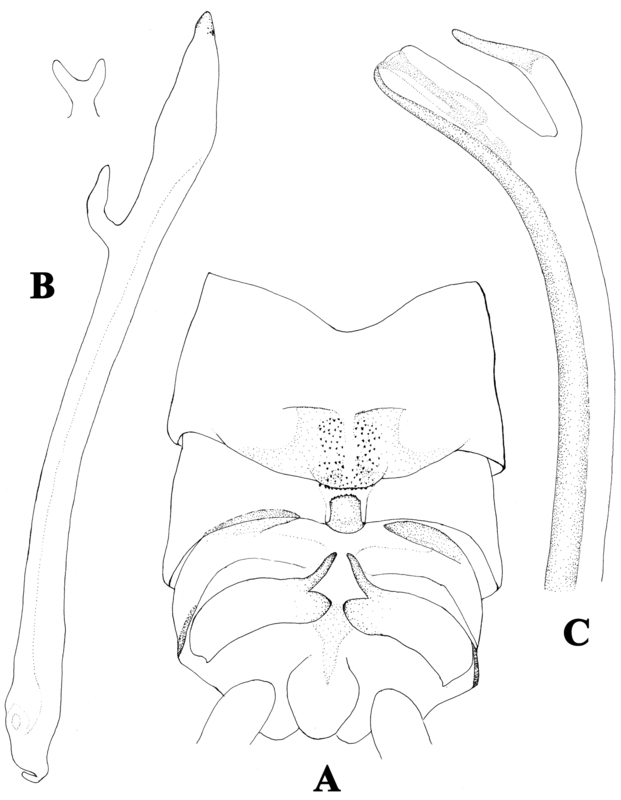 Diagnosis.The male of Neoperla furcostyla is characterized by an elongate, almost straight aedeagal tube bearing a subapical fork with common stem. The aedeagal sac is triangular in shape and barely one fifth as long as tube; several dorsoapical spines and patch of smaller ventroapical spines are present at apex (Figs 1C, 2B). The type of the aedeagus of the new species is also found in Neoperla forcipata Yang & Yang, 1992 known from Mt. Wulingshan of Hunan Province of China, but the aedeagus of this species is different. In Neoperla forcipata (Fig. 2C), the aedeagal tube is more robust and has an obtuse curve near the subapical fork, and the fork is much larger than that of Neoperla furcostyla. The sac of Neoperla forcipata though not everted, has an evident lateral flap subapically that is absent on the sac found in Neoperla furcostyla. The new species is assigned to the Diehli subgroup of the Montivaga species group (Zwick 1983). The holotype of Neoperla forcipata Yang and Yang is apparently damaged at the base of the aedeagal tube, very possibly due to an overlooking of this elongate type of tube during the course of dissection. In this case, it is safe to cut the abdominal at the fifth or preceding segments in order to keep this kind of tube intact after dissection. Neoperla similidella Li & Wang sp. n.
Holotype: male, China: Fujian Province, Mt. Wuyishan, Kekao Station, 735 m, 27.7478N, 117.6831E, light trap, 12 Jul. 2009, Shi Li and Liu Xiao-Yan. 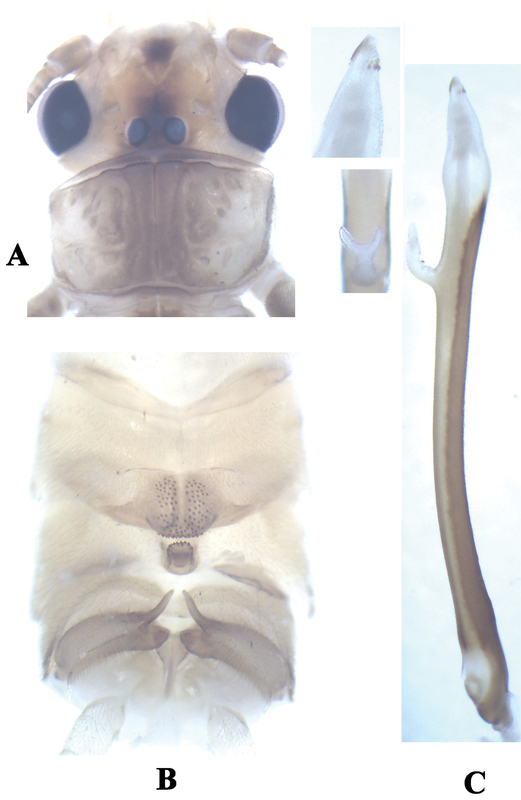 Paratypes: 2 males, same data as holotype. Male. Forewing length 12.6–12.8. General body color dark brown. Distance between ocelli ca. 1.5X as wide as diameter of ocellus. Head slightly wider than pronotum, with a large black ocellar patch barely touching the compound eyes and a black trapezoidal patch on frons (Fig. 3A); compound eyes dark; antennae dark brown. Pronotum dark brown with pale brown to brown lateral margins (Fig. 3A); wing membrane pale brown, veins dark; legs yellow, basal third of tibiae darker. Abdomen dark brown, terminalia darker. Cerci dark except 1st segment brown. Neoperla similidella Li and Wang, sp. n. (male). A Head and pronotum, dorsal view B Terminalia, dorsal view C Aedeagus before eversion, lateral view D Aedeagus, lateral view E Aedeagal sac, dorsal view. Neoperla similidella Li and Wang, sp. n. (male). A Aedeagal sac, dorsal view B Aedeagal sac, ventral view C Aedeagus, lateral view D Terminalia, dorsal view. Process of tergum 7 large, rounded and upraised, mostly covered with sparse sensilla basiconica but margined with denser sensilla basiconica patches (Fig. 3B). Tergum 8 with an upcurved tongue-shaped process, fringed with small distal spines. Tergum 9 without sensilla patches. Hemitergal processes of tergum 10 slightly curved medially (Figs 3B, 4D). Aedeagal tube darkly sclerotized, slender and mostly straight but with a gradual dorsoapical curve, dorsal surface heavily sclerotized, with many spinules on dorsal surface (Fig. 3C). Aedeagal sac about half as long as tube and gradually curved ventrad; along dorsoapical surface with a patch of small and median sized spines, and two rows of large stout spines apically (ca. 7 spines) (Figs 3E, 4A); mostly ventral and lateral surfaces of apical half of sac with small spines (Figs 3D, 4C); apex of the sac with several medium sized spines (Figs 4B). The specific epithet refers to the great similarity to the species Neoperla idella Stark & Sivec, 2008. This species is characterized by its dark body color and the head with a large black ocellar patch barely touching the compound eyes and a black trapezoidal patch on frons. The aedeagal sac has a patch of small and medium sized spines, and two rows of large stout spines that range from mid length to the apex of the dorsal surface (ca. 7); ventral and lateral surfaces of the apical half of the sac have small spines and the apex of the sac has several medium-sized spines. The aedeagus of the new species is very similar to that of Neoperla idella, however in that species the aedeagal tube lacks a subtle dorsoapical curve and the sac is more strongly curved ventrad (Stark and Sivec 2008, figs 36–37). In addition, the aedeagal sac of Neoperla idella lacks a ventroapical patch of small spines and also lacks medium sized spines. Both species bear similar patches of large spines on the dorsoapical margin of the sac but in the new species the ventrolateral patch of small and medium spines is located nearer the sac apex than in Neoperla idella. We acknowledge the partial support of our research by the National Natural Science Foundation of China (No. 31000977). Chu Y-T (1929) Descriptions of four new species and one new genus of stone-flies in the family Perlidae from Hangchow. The China Journal 10: 88-92. DeWalt RE, Neu-Becker U, Stueber G (2012) Plecoptera Species File Online. Version 1.0/4.1. [12/16/2012]. http://Plecoptera.SpeciesFile.org. Du Y-Z (1999) Plecoptera. In: Huang BK (Ed) Fauna of Insects in Fujian Province of China. Vol. 3. Fujian Science and Technology Publishing house, Fuzhou, Fujian, China. 301–335. Du Y-Z (2000a) Neoperla magisterchoui, a new species of the genus Neoperla Needham (Plecoptera: Perlidae) from China. In: Zhang YL (Ed). Systematic and faunistic research on Chinese insects. Proceedings of the 5th National Congress of Insect Taxonomy. China Agriculture Press. Beijing: 1-3. Du Y-Z (2000b) Two new species of the genus Neoperla Needham (Plecoptera: Perlidae: Perlinae) from Guizhou, China. Entomotaxonomia 22: 1-5. Du Y-Z, Sivec I (2004) Plecoptera: Perlidae, Nemouridae, Leuctridae. In: Yang XK (Ed.). , Insects from Mt. Shiwandashan area of Guangxi. China forestry Publishing House, Beijing: 39-45. Du Y-Z, Sivec I (2005) Plecoptera. In: Yang XK (Ed.). , Insect Fauna of Middle-west Qinling Range and South Mountains of Gansu Province. Science Press, Beijing: 38-54. Du Y-Z, Wang Z-J (2005) Plecoptera: Leuctridae, Nemouridae, Perlidae and Peltoperlidae. In: Yang MF, Jin DC (Eds). , Insects from Dashahe Nature Reserve of Guizhou. Guizhou People Press, Guiyang, Guizhou: 51-57. Du YZ, Sivec I, He J-H (1999) A checklist of the Chinese species of the family Perlidae (Plecoptera: Perloidea). Acta Entomologica Slovenica 7: 59-67. Du Y-Z, Wang Z-J (2007) Nemouridae and Perlidae. In: Li ZZ, Yang MF, Jin DC (Eds). , Insects from Mountain Leigongshan Landscape of Guizhou. Guizhou Science and Technology Publishing house, Guiyang, Guizhou: 84-90. Du Y-Z, Sivec I, Zhao M-S (2001) Plecoptera. In: Wu H, Pan CW (Eds). Insects of Tianmushan National Nature Reserve. Science Press, Beijing: 69-80. Li W-H, Wang R-F (2011) A new species of Neoperla (Plecoptera: Perlidae) from China. Entomological News 122: 261-264. Li W-H, Wang G-Q, Lu W-Y (2012) Species of Neoperla (Plecoptera: Perlidae) from Hubei, China. Zootaxa 3478: 32-37. Li W-H, Wang G-Q, Li W-L, Murányi D (2012) Review of Neoperla (Plecoptera: Perlidae) from Guangdong Province of China. Zootaxa 3597: 15-24. Li W-H, Wu L-M, Zhang H-R (2011) A new species of the genus Neoperla (Plecoptera: Perlidae) from Henan, China. Acta Zootaxonomica Sinica 36: 33-35. Sivec I, Zwick P (1987) Some Neoperla (Plecoptera) from Taiwan. Beiträge zur Entomologie 37: 391-405. Sivec I, Stark BP, Uchida S (1988) Synopsis of the world genera of Perlinae (Plecoptera: Perlidae). Scopolia 16: 1-66. Stark BP, Sivec I (2008) New species and records of Neoperla (Plecoptera: Perlidae) from Vietnam. Illiesia 4: 19-54. Wu C-F (1935) Aquatic insects of China. Article XXI. New species of stoneflies from East and South China. (Order Plecoptera). Peking Natural History Bulletin 9: 227-243. Wu C-F (1938) Plecopterorum sinensium: A monograph of stoneflies of China (Order Plecoptera). Yenching University, 225 pp. Wu C-F (1948) Fourth supplement to the stoneflies of China (Order Plecoptera). Peking Natural History Bulletin 17: 75-82. Wu C-F (1962) Results of the Zoologico-Botanical expedition to Southwest China, 1955–1957 (Plecoptera). Acta Entomologica Sinica 11 (Supplement): 139–153. Wu C-F (1973) New species of Chinese stoneflies (Order Plecoptera). Acta Entomologica Sinica 16: 97-118. Wu C-F, Claassen PW (1934) Aquatic insects of China. Article XXI. New species of Chinese stoneflies. (Order Plecoptera). Peking Natural History Bulletin 9: 111-129. Yang C-K, Yang D (1990) New and little-known species of Plecoptera from Guizhou Province (I). Guizhou Science 8: 1-4. Yang C-K, Yang D (1991) New and little-known species of Plecoptera from Guizhou Province (II). GuizhouScience 9: 48-50. Yang D, Yang C-K (1992) Plecoptera: Perlidae. In: Huang FS (Ed.). , Insects of Wuling Mountains area, Southwestern China. Science Press, Beijing: 62-64. Yang D, Yang C-K (1993) New and little‐known species of Plecoptera from Guizhou Province (III). Entomotaxonomia 15: 235-238. Yang D, Yang C-K (1995a) Three new species of Plecoptera from Hainan Province. Acta Agriculture Universitatis Pekinensis 21: 223-225. Yang, D, Yang C-K (1995b) Plecoptera: Perlidae. In: Wu H (Ed.). , Insects of Baishanzu Mountain, Eastern China. China Forestry Publishing House, Beijing: 59-60. Yang D, Yang C-K (1996) Four new species of Plecoptera from Nei Mongol. Journal of China Agricultural University 1: 115-118. Yang D, Yang C-K (1998)Plecoptera: Styloperlidae, Perlidae and Leuctridae. In: Wu H (Ed). Insects of Longwangshan. China Forestry Publishing House, Beijing: 40-46. Zwick P (1983) The Neoperla of Sumatra and Java (Indonesia) (Plecoptera: Perlidae). Spixiana 6: 167-204.